NC WATERMAN CHAOS... THE TRUE STORY... IT HAD TO BE SAID! For those of you curious to hear what really happened... it's simple. 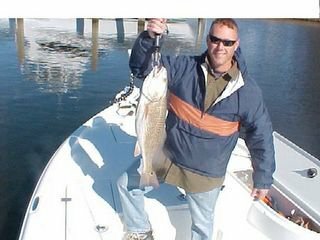 For over three years (prior to this WWW.NCCHARTERFISHING being created) Bill Hitchcock was trying to promote his new site... he used guides like myself to promote the site. We got some free advertising in the process... post reports with contact info... we helped him create TV shows, sent our clients to his website, typed detailed reports with awsome pictures to attract folks and also talked it up for him in return. Early this year, 2005, Bill said he was selling his film production co. and going full time into his website. He stated on the site how he was going to have to start charging for site usage (either the general population or the charter capt.'s). Wound up he informed us early this year he was going to start charging us charter capt. 's for advertising. I don't blame him... that's better than charging the multitude of users. I responed that I was not interested in paying for advertising as I am already turning down 100 or more clients per year. I was supposed to make sure there was no advertising in my posts. Although I did receive some business from Bill's site in the past with contact info. etc allowed in my posts... I was there for the commradery, not the advertising as I already have more business than I could handle. 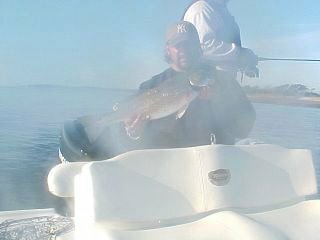 About six months later, in October, a fishing report of mine got deleted by Bill with no personal call, no warning, nothing.... with his replacement post stating that my post contained advertising. I pulled up the post off my hard-drive and realized that one of my pictures had an automated caption "posted by nccharterfishing," the next chance I had to get on the computer... (the next morning), I got onto the ncwaterman website and went to put an apology on Bill's replacement post but noticed that dozens of members were upset with Bill for deleting my post... then I noticed that Bill Hitchcock had responded by bad mouthing my reputation, saying that I have been trying to advertise for free intentionally, that I have done nothing for his site in the three years (which I have shared knowledge and info with his users and sent all of my personal clients to his site) but rather he stated that his site has done so much for me. All the while, Bill had never so much as left me a message, contacted me personally for any reason! One day I post with a mistake,,, he deletes it... goes off on me and my reputation. I bit my tongue and responded with what was called a gentlemen's response by a very Well known captain and supported of the NCW site as well as the users of the board. In the meantime, the guidelines for what "advertising" is were modified since the last time I had read them and had never been given notice that they were changed. 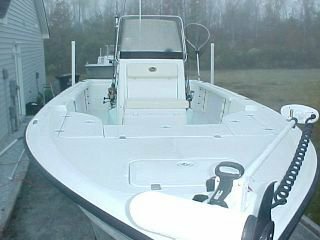 So, the next time I posted was a response to many members asking me about a new boat I purchased. 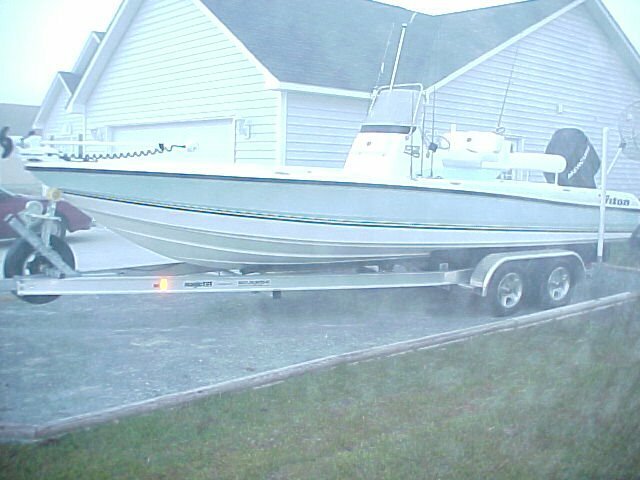 Excited about my new boat I happily responed to members requests... I posted pics of the new boat and told what I though about my service from the Triton co... others asked me about options and stats on the boat...so I pasted the info for them... I provided the info folks asked me for... just like I do in my fishing reports. I posted no advertising for my company... i wasn't advertising for anyone... but apparantly because I got a small discount on my boat (no diff. than any fisherman's winter boat show price savings) the result was removal of my account on NCW. loss of access to the site. JUST SO YOU ALL KNOW... I HAVE NEVER BEEN CONTACTED BY BILL HITCHCOCK OR ANY REPRESENTITIVE OF NCWATERMAN FOR ANY REASON ANYTIME SINCE HE FIRST TOLD EVERYONE HE WAS GOING TO START CHARGING SOME USER GROUP FOR USE OF HIS SITE....(about 9 months ago) I HAVE NEVER ASSUMED ANYTHING NEGATIVE ABOUT ANY INDIVIDUAL (INCLUDING BILL)nor POSTED NEGATIVE ASSUMPTIONS ON MY SITE OR ANYONES SITE...(LIKE BILL IS STILL DOING ON HIS SITE CURRENTLY). 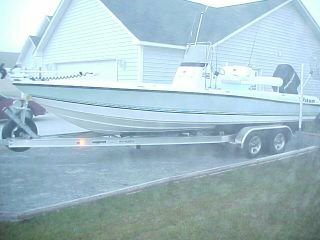 I DID PAY HARD EARNED MONEY (ALOT) FOR MY NEW BOAT EVEN THOUGH BILL HITCHCOCK MADE THE STATEMENT THAT I PROBABLY GOT IT FOR FREE. I DID HELP BILL'S SITE AND ANY INDIVIDUAL THAT WANTED FISHING RELATED INFORMATION (whether email, personal mail, telephone calls, etc) AND ALWAYS WILL DO THE LATTER. 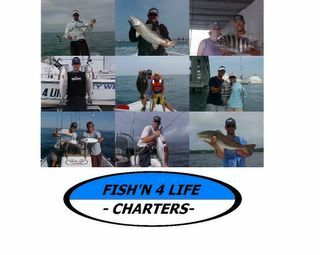 MY BUSINESS, MY LIFE IS FISHING... HIS SITE ISN'T A LOSS TO ME. NOT GETTING TO TALK TO THOSE OF YOU THAT WERE THERE FOR FISHING INFO. IS... 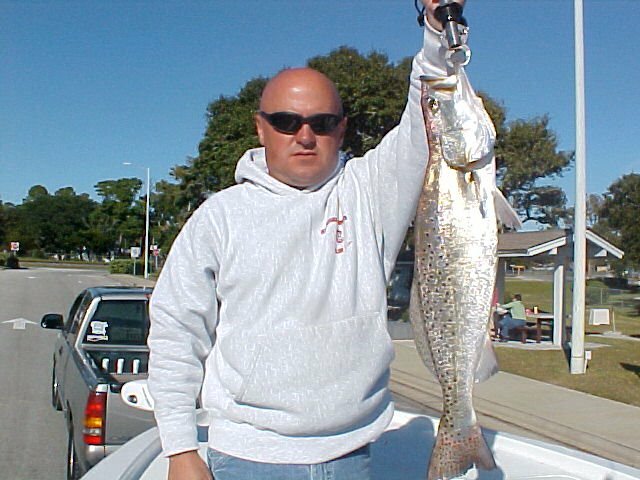 BUT I WILL SEE AND TALK TO YOU ON THIS SITE IN THE FUTURE AND ON MANY OTHER USER FRIENDLY SITES... LIKE WWW.SPORTFISHERMEN.COM , WWW.NCCOASTALFISHING.COM , WWW.FISHERMANSPOST.COM , WWW.FINTALK.COM , ETC. who have all welcomed me as a fellow fisherman and user of their boards. I HAVE BEEN A TEACHER FOR 9 YEARS. ONE OF THE MOST IMPORTANT THINGS I HAVE LEARNED OVER THAT TIME IS THAT YOU MUST ALWAYS GET TO KNOW SOMEONE AND NEVER MAKE ASSUMPTIONS ABOUT AN INDIVIDUAL... I DON'T APPRECIATE ANY OF BILL HITCHCOCK'S ASSUMPTIONS OF ME... AS CAN BE NOTED IN EVERY RESPONSE TO HIS WEBSITE MEMBERS REGARDING ME. HIS LIES ABOUT CONTACTING AND TALKING TO ME... ETC. I HAD PLANNED ON ADVERTISING WITH BILL PRIOR TO TWO MONTHS AGO... (AS SOON AS I COULD AFFORD TO) BUT NOW, I WILL NEVER DO BUSINESS WITH HIM DUE TO GETTING TO KNOW WHO AND WHAT HE REALLY IS OVER THE PAST 2 MONTHS. This is the first and last response by a very irritated fisherman (me) regarding the matters of NCW. I apologize to any of my regular clients who are not aware of the situation who have been forced to see this response post... but I did not think it fare to post it on any other individual's site and I have bit my tongue long enough with all the lies and assumptions about myself by ONE certain individual. 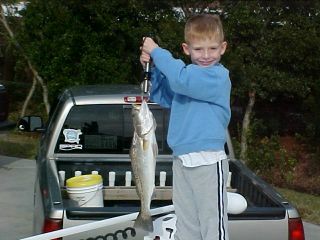 KEEP FISH'N4LIFE AND TEACH A YOUNG ONE THE SPORT! 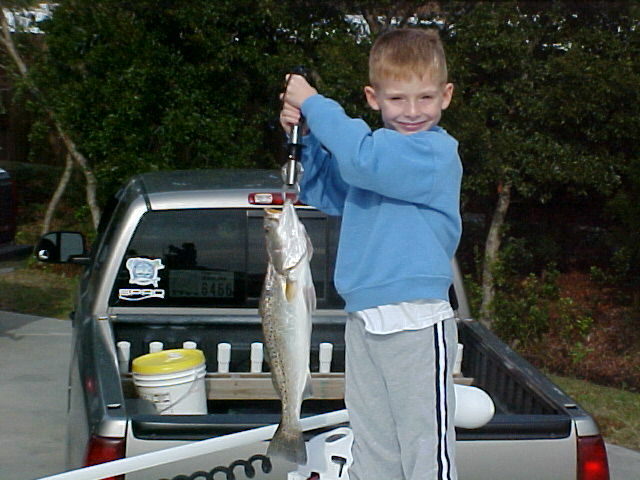 11/27/05 Jason Guthrie's son holding up a 3lb speck.... You go boy! 11/26/05 a tiny flounder on a gulp shrimp. 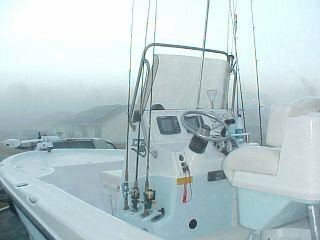 11/25/05 6 Hr Trip with Win Edwards and Crew aboard... Yikes it was cold and windy... Temps started out in the low 30's at 7am and never got higher than the low 40's. The winds weren't light like forecasted but rather 15 to 20 all day. We decided to get out of the wind and creek fish a little which proved to be a good idea. We wound up landing 11 red drum and a few trout on both live and artificial baits. Good job sticking it out in the cold guys! Capt. Jeff Cronk. We had a good time in Fla. even though the Nationals were cancelled. 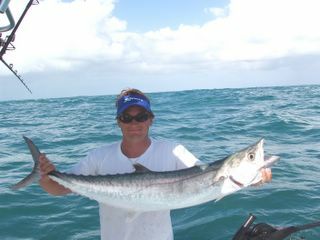 We did manage to find some Kings, this one was only about 18 lbs. 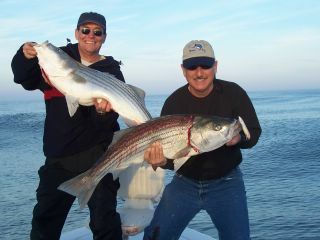 The Stripers will be showing soon as well as the Bluefin Tuna so call now to book your trip! 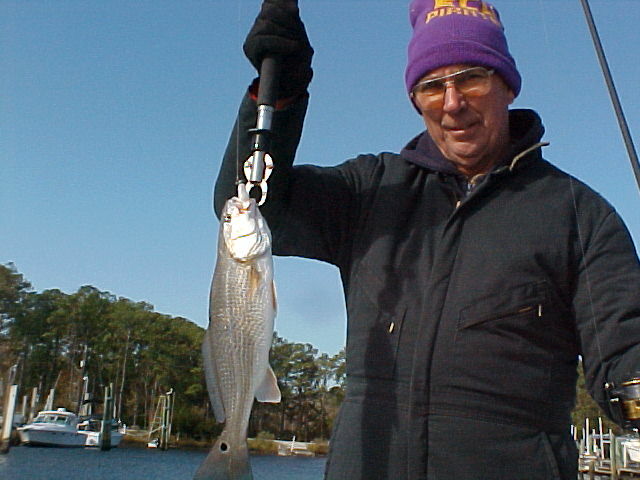 Red Drum- The Red Drum are slowly moving through their migration patterns... The masses of large fish 10+lbs are heading south and offshore... the smaller fish from undersize pups to 10lbs are heading south along the surf stopping and feeding hard around the inlets and inlet shoals along the way.... the local population of reds from juveniles to several lbs are moving up the local rivers and mainland creeks of the sounds, and there will be some mixed size fish that remain in the deep water near the inlets and ICW for the winter which tend to move into the shallow bays of the sounds and creeks protected by the North Winds where the bay temps can rise as much as 10 degrees higher than the deeper water during the warm winter days with high sunlight.... Currently we are WEARING OUT the reds in the surf zone... carefully fishing the breakers from our boats and from the sand... These fish are striking most soft plastic artificials (ie. 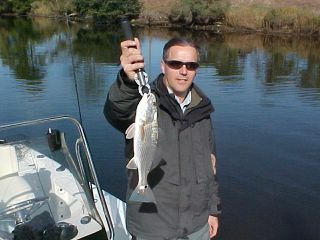 calcutta swim shad, zoom super-flukes on 1/2oz lead heads, and Berkley Gulp Shrimp/Minnows). If the fish get finiky... live mullet or cut mullet will work. Dudley's Marina (252-393-2204) here in Swansboro will be stocked with live mullet from 3 to 6in. long all winter as Capt. Mike Taylor and Myself will keep the Marina stocked. 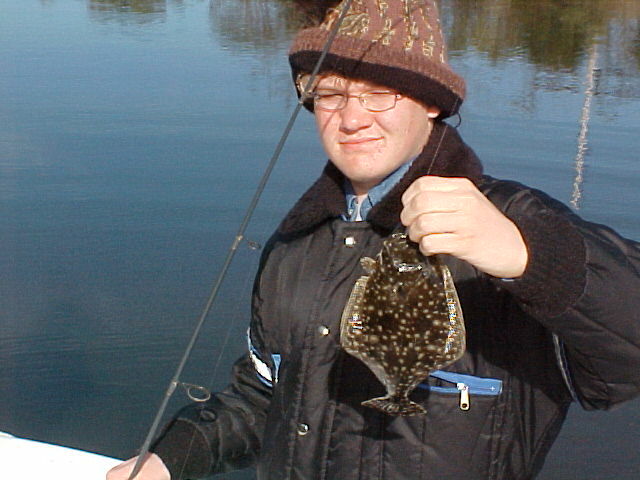 Flounder- The summer flounder are migrating slowly offshore and can be easily targeted through Dec. by following them offshore... typically you will catch flounder in the 5 to 10 mile range throughout November and December... Places to target will be the live bottoms like Lost Rock, ledges, and artificial reefs like AR 330, AR 345... as well as wrecks like the Hutton and WR 13. Most of the smaller Southern Flounder tend to migrate up river and upstream mimicking the migration pattern of the bait (small shad, mullet, shrimp, and other small finfish) They can be targeted through December... then the bite halts till March as the water temps get below their feeding/functioning range... they enter a sort-of hybernation state as their metabolism slows and they bury themselves up in the soft muddy bottoms present up the rivers. 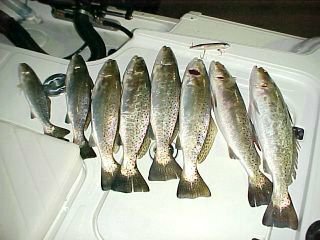 There will be southern and summer flounder caught in the deeper water near the inlets and near-by feeder creeks and channels as well as the ICW throughout November and slowing in December. 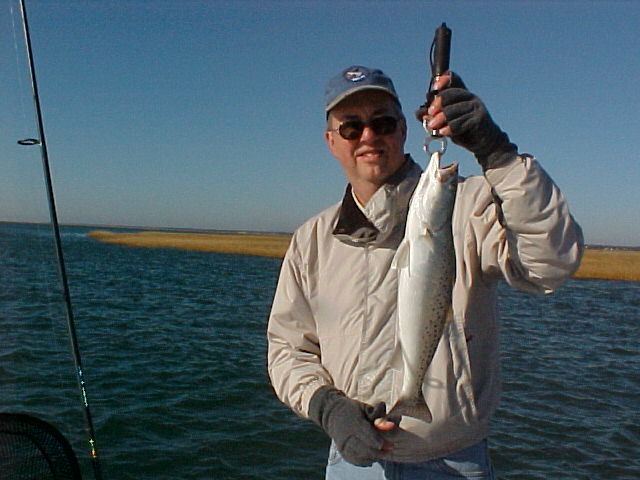 Bluefish- The bluefish can withstand colder temps. 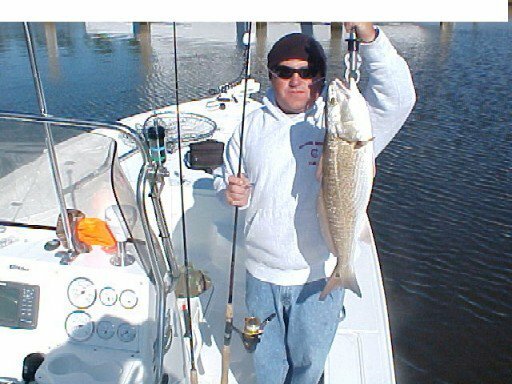 than most fish but they are major migrators... Expect to catch blues throughout Nov. and Dec. on the internal waters and along live bottoms, wrecks, etc from the beach out. 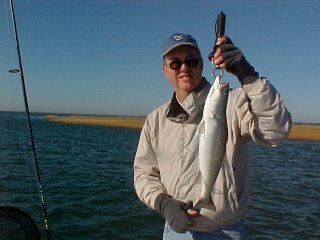 By January we tend to see very few bluefish along our area of the coast although some big fish might be present mixed in with the schools of Stripers coming down from up north as well as offshore in the deeper waters. Striper (in NC). 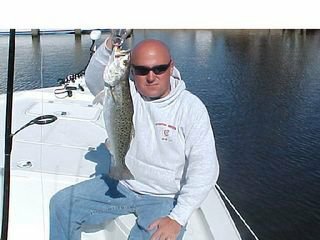 - Although we are seeing striper in Northern NC (Oregon Inlet and such) as early as November... we typically begin to see good runs of striper around Cape Lookout around the 2nd week of December and the concentrations last until around mid January. Then the water temps typically get very cold driving these fish farther offshore. 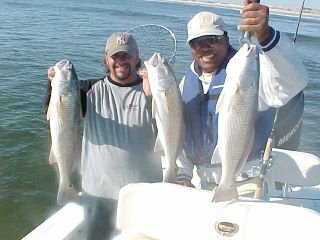 although there have been good schools of stripers spotted along the face of Cape Lookout National Seashore in Late Jan. and Feb. on warm days. The best window of Opportunity for the average boater is still Mid Dec. to Mid January around Lookout to MHC. 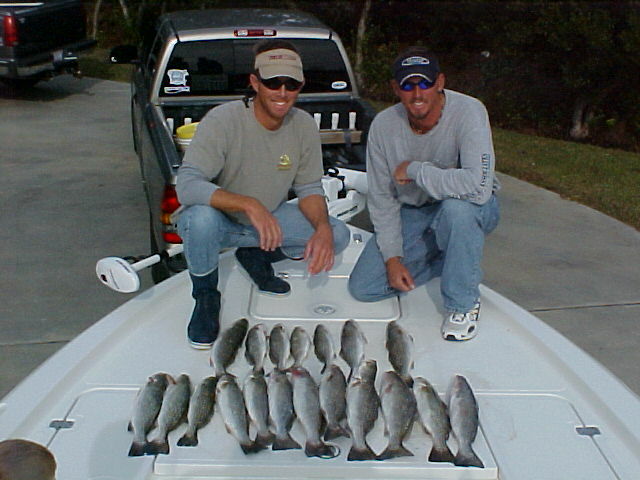 Aboard FISH'N4LIFE... Jan 2005 produced the best day ever with over 300 strikes/ hook-ups on topwater baits/ light 12lb test spinning tackle/ w/38 fish landed between 15 and 30lbs. 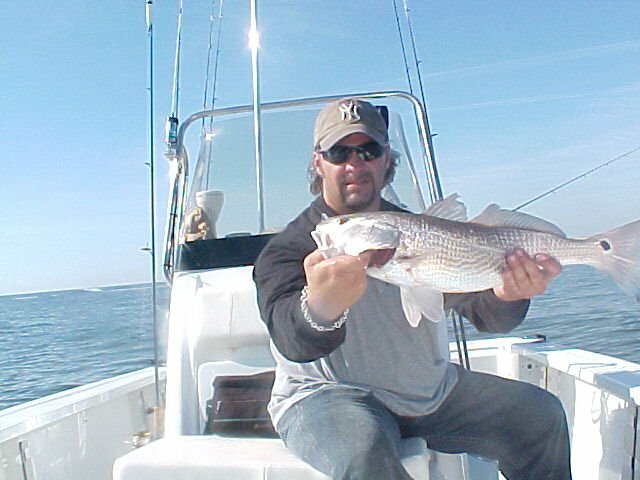 Our largest fish in the 2004/2005 season was 40lbs on light tackle. I hope this season proves to be as good... especially since the Menhaden plant in Beaufort, NC is now closed! I Hope everyone has a great Holiday Season! Get out and catch a few fish! and Be Safe! Teach a Young One the Sport! 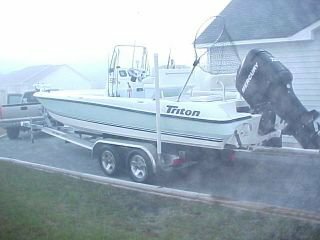 11/14/05 Put the boat in the water at 4:00pm this afternoon to help capt. Mike Taylor transport a load of live shrimp he caught today... got finished at 5:30 (dusk) and decided to take advantage of the pretty evening with the near full moon in the sky, no wind, warm weather, and rising tide. Pulled up to a favorite hole with a black mirrolure on one rod and a black back top dog on the other.... set the autopilot to hold me in a location within casting dist. of where the trout lay and on first cast put a 2+lb trout in the boat... it was on from about 6pm till 7pm when the tide slowed... wound up landing two trout 3.5 and 4lbs on the topdog, missed several others, and lost the topdog to a bigboy that crushed it... landed 6 from 1.5 to 3lbs on the black mirrolure and missed several others that pulled off. Back at the dock at 7:30 and extremely happy with the evening bite! 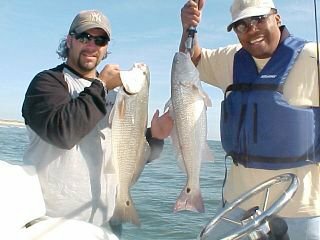 Expect the same bite to occur Tuesday before the nasty weather gets here.... go give it a try... it's so much fun! Capt. 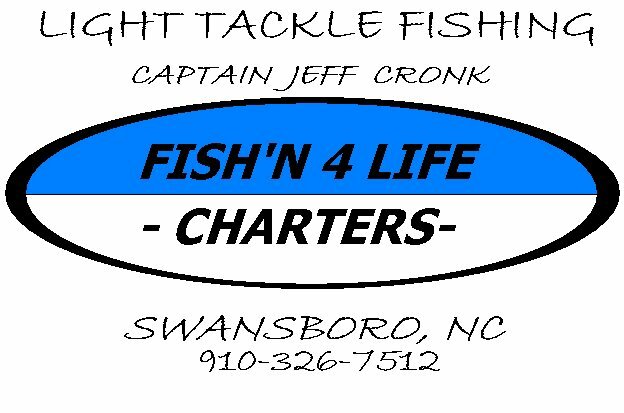 Jeff Cronk - FISH'N4LIFE CHARTERS- 910-326-7512 or 336-558-5697. 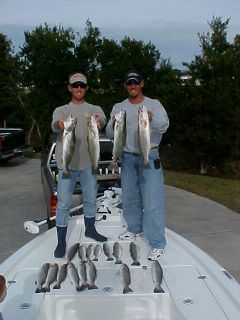 11/13/05 Fished 2nd trip aboard the new boat today with Derrick and his buddy aboard from Greensboro for 6hours. 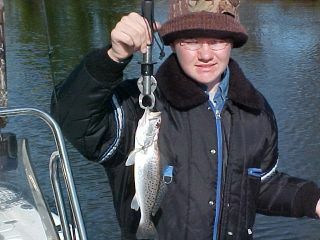 We had a ball today in the morning with the small specks and grays. 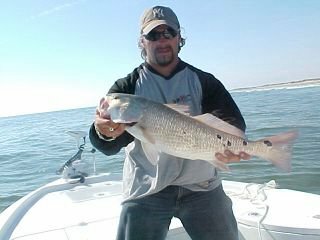 We put 50 or more specs and a few grays in the boat along with a few reds up to 26in.... then, we switched over to searching for reds in the shallows... we wound up locating some schools with 500 or more fish in them and managed to land about 40 fish in an hour and a half... all on artificials... the new 60gallon tank worked great for a holding tank. Most of the reds were between 24 and 28in. with several about 20in. mixed in.... super job guys! 11/6/05 ED SEWELL TROUT TOURNY... 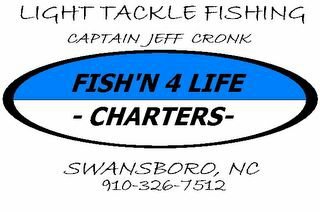 Team FISH'N4LIFE/TAYLOR MADE... we finished 8th place with 19 keeps and a 2 fish aggregate of 4lb 12oz.. big fish at just 2lbs 9.1oz today... a little small but a tough day locally and happy to place.